D'IBERVILLE -- City leaders worked for more than 20 years to get D'Iberville's first casino built, and now they are preparing to support the developers with TIF bonds as Scarlet Pearl nears its debut. "This is my philosophy," Mayor Rusty Quave said after he and the council voted Tuesday to start the process to issue the promised tax-increment financing bonds. "Business just does not come and knock on your door." D'Iberville used TIF bonds to help developers pay for roads, utilities and other improvements at shopping areas along Sangani Boulevard and at The Promenade, he said. The council is prepared to grant the casino developer bonds for up to $14 million, but Quave said it could instead run about $7 million to $10 million. The taxes generated by the project repay the bond. A public hearing on the bond is scheduled at the start of the next council meeting at 6 p.m. Sept. 15. 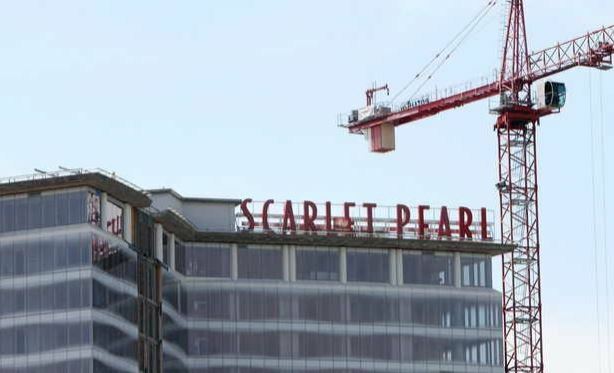 Frank Ellsworth with The Fine Point Group said Scarlet Pearl Casino is still scheduled to open by the end of the year. The building just east of Interstate 110 is completely closed in and many areas are air-conditioned as crews paint and carpet guest rooms and start work on the hotel lobby floor. "There's actually a decorative oak tree that's going inside," he said. It is being fashioned in the lobby by the same company that is starting to build the championship miniature golf course just north of the casino. Ellsworth said job fairs are planned for 7 a.m. to 7 p.m. Sept. 23 and Oct. 14 at the D'Iberville Civic Center near City Hall. Those who've already applied for jobs don't need to attend, he said. Quave said D'Iberville has developers looking at a French Village concept downtown near the casino, and has a proposal for a hotel and convention center. The city will try to attract companies seeking to move into a tourist area, but said, "You're not going to get them unless you have a TIF plan."